Hello! 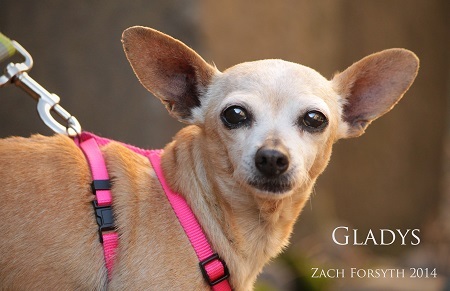 I’m Gladys, a 10 years young Chihuahua. I have LOTS of hobbies including marathon napping, lap warming and I make a great little shadow. Im currently working on making a quilt. I do at least one crossword puzzle a day to exercise my mind and stay sharp. Today I went with my foster mom to the hair salon. She says it was one of the best hair cuts she’s ever had because I sitting on her lap the whole time. How sweet…. All in all I make a great relaxing companion and gal pal. I love reading books on the couch and nice leisurely walks while wearing one of my favorite sweaters. I have been known to fall asleep sitting up and I have a very cute little old lady snore. It’s dainty and precious. When I’m not relaxing I’m quite social butterfly, I love other dogs, cats and people. I like kids, but not too small, because I’m so petit. My favorite thing to do is to snuggle up on a warm lap or a spot in the sunshine. Zzzzzzz….. I’m vaccinated, microchipped and spayed. I’d love to be your girl. Hope to see you soon. Fill out an application at pixieproject.org so we can schedule a meet and greet. My adoption fee is $100.